Proponents contend that dam-building will create "a new era of abundance." But critics argue that dams, such as Los Vaqueros in Contra Costa County, are environmentally destructive and too expensive. On the edge of the Yolla Bolly Wilderness, about 15 miles north of the dusty town of Covelo, 81-year-old Richard Wilson sat across from me in a ranch house that his father constructed here in the 1940s. For much of his adult life, Wilson has defended the meaning and importance of the Round Valley area of Mendocino County and the values that he and other local people attach to it. So while the ostensible purpose of my visit was to discuss Wilson's unique personal role in shaping California's water engineering history, it was no surprise that he also held forth on the local impacts of the four-year-long drought. "When we get good, wet winters, the snow packs down on the mountaintops at about 4,000 feet, then holds there into the summer," explained Wilson in his spare and relaxed style. "As the snow melts, it keeps the grass growing, and that's how you know where to find your cattle. In the last four years, there's just been no snow." Wilson's expansive spread, known as Buck Mountain Ranch, spans a portion of the state's third largest watershed: the Eel River. Few places in California are more remote from urban life than Round Valley, but the watershed and Wilson are central to understanding why Governor Jerry Brown and other powerful interests are avidly pursuing several multibillion-dollar dam projects and two massive water tunnels that are strikingly similar to plans laid out in economic and engineering charts in California in the early-1950s. In 1960, state voters narrowly approved the California Water Project, which is still the largest bond issue in the state's history when accounting for inflation. (It cost $14.31 billion in today's dollars.) By the end of the Sixties, the water project had blocked the Feather River in the Sierra foothills with what was then the world's tallest dam, the Oroville Dam. The bond had paid for giant pumping stations in the Sacramento-San Joaquin River Delta to move water into canals that parallel Interstate 5 through the San Joaquin Valley, via the 444-mile-long California Aqueduct. But the State Water Project has never fully been built, and Richard Wilson is a major reason why. In 1967, the US Army Corps of Engineers unveiled a proposal to construct the largest dam and reservoir project in California history: the so-called "Dos Rios Dam" on the Middle Fork of the Eel River. In addition to being 742 feet tall, the dam would have flooded a 40,000-acre area for its reservoir, equal in surface area to the Shasta and Oroville reservoirs combined. These liquid resources would have then passed through thirty miles of ditches and tunnels in the Mendocino National Forest and into a smaller reservoir on the west side of the Sacramento Valley. For California's water industry, the Dos Rios Dam was the key project that would unlock a host of others. Having completed a series of mega-water projects throughout the mid 20th century, state and federal water developers had long trained their sights on California's North Coast, where about one-third of the state's surface water flows mostly unimpeded to the ocean through magnificent mountain ranges and redwood groves. Besides for the Eel, the US Congress had authorized feasibility studies for dams and reservoirs on the Klamath, the Lower Trinity, the Mad, and the Van Duzen rivers. 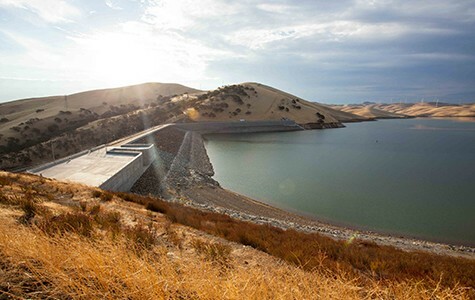 The Dos Rios reservoir would have flooded Round Valley, a 24-square-mile alluvial basin that is home to one of California's largest Native American reservations, and which, in the late Sixties, had a population of about 1,500. Wilson and his wife, Susan, who then lived in Round Valley with their three children, mounted an opposition campaign. Although both Susan and Richard came from well-connected Republican families, they were up against interests whose power was roughly equivalent to that of the coal industry in Kentucky — or so it seemed. 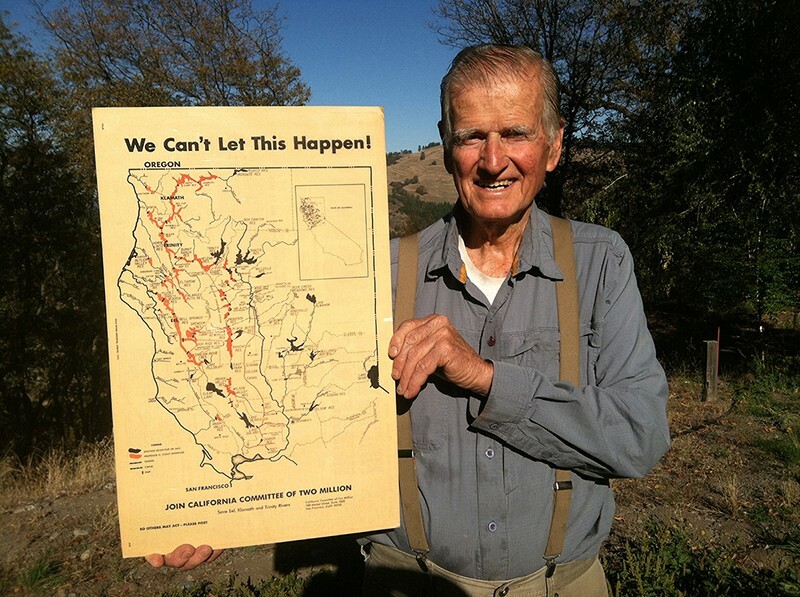 Richard Wilson helped bring an end to California's last dam-building era. Wilson's fireplace mantle displays memorabilia from his unique civic life, including a picture of him shaking hands with former California Governor Pete Wilson, under whom he served as director of the California Department of Forestry and Fire Protection in the 1990s. An autographed picture of former US president Richard Nixon occupies a slot nearby. But the largest item is located on the mantle's far left: a California Department of Water Resources map depicting the state's northern coastal rivers almost entirely submerged by reservoirs and blocked by dams. The big, bold header screams in red lettering: "We Can't Let This Happen!" By 1969, the opponents of Dos Rios Dam had rallied enough support in Sacramento that then-Governor Ronald Reagan declined to support the project. The environmental movement had spawned mainstream acceptance of the idea that rivers are vital natural ecosystems that should be protected, and that dams erected to divert water for agriculture, cities, and suburbs had pushed numerous fish species to the brink of extinction. "The thing about Dos Rios was: It was really a project that was out of step with the times because I think we were moving on to other ways of looking at water," Wilson said. The victory over the dam marked a stunning defeat for California's water industry. And it had a cascade of consequences. In 1972, the state legislature passed the California Wild and Scenic Rivers Act, which prohibited construction of new dams on the Smith, Klamath, Scott, Salmon, Trinity, Eel, Van Duzen, and American rivers. Though dam proponents subsequently retreated from the North Coast, their dream of capturing large new water sources to fuel an everlasting cycle of growth and development has never fully faded. And California's epic four-year drought, characterized by reservoirs that sport bathtub rings where water once was, has given them perhaps their last best chance to launch a new era of dam-building in California.